If it were not so pitiful, it would be hoot to just sit back and watch our august state House of Representatives stumble around, looking, for all the world, like a Three Stooges act as it tries to sort out who is in charge. A quarter of the way through the Legislature’s statutory 90-day session, as this was written, the House had no speaker, leadership was undetermined, committee assignments remained uncertain, legislation was trapped in limbo, a budget was coming due – and Alaskans were getting the short end of the stick. The Legislature was stalled. Worse, the thumbs-twiddling was costing the state a lot of dough each and every day while not much was getting done. The Legislative Information Office estimates it costs about $37,000 per day to pay for the Legislature while it is in session. That figure includes payroll, per diem and miscellaneous services and equipment costs. The then-25 days of unorganized legislative inaction - a record, by the way - had cost Alaska about $925,000, with darned little to show for it.That is a lot of money to piddle away because of outsized egos and a hankering for political power. In a state with a $1.6 billion budget deficit, you might think lawmakers would be more attuned to the notion of not tossing nearly a million dollars down a rat hole - but you would be wrong. With 23 Republicans in the 40-member House, an observer could be forgiven for thinking a majority clearly is evident, but that discounts, in the kindest terms, political treachery. Republican Reps. Louise Stutes, of Kodiak, and Anchorage’s Gabrielle LeDoux started caucusing with House Democrats last year to give them control. The two got nifty committee assignments in return. LeDoux, it should be noted, was a Democrat when she lived in Kodiak and ran for the state House. She magically morphed into a Republican in Anchorage’s District 15, the land of dead voters and unresolved ballot irregularities. With them out, that leaves 21 Republicans in the House caucus. No problem, right? Enter Rep. Gary Knopp, the Kenai Republican who made it a problem. He bailed out of the caucus to do his own thing, leaving it in a 20-20 standoff with Democrats - and the Legislature in a mess. Knopp was a registered Democrat when he moved to Alaska in 1984, and remained so for the next 26 years, when he registered as a Republican in 2010 just in time to seek office in his largely Republican district, Must Read Alaska reports. He ran for re-election unopposed last year. Not only did Knopp, a former Kenai Borough Assembly president, bolt the foundering GOP House legislative caucus, he had the bad manners to be sanctimonious about it, firing off op-pieces hither and yon detailing his vision, explaining why a narrow majority would fall apart; that a bi-partisan coalition - maybe a 50-50 split, by golly - was the only way to move forward; that, in essence, it was his way or the highway. He said nothing about his plan’s ultimate outcome being the subversion of last year’s election results - and awarding Democrats political power the majority of Alaska voters did not give them. Along with pushing his idea of what a coalition should be, his op-eds unabashedly detailed other demands, too. No changes to the state’s oil and gas tax credits. No broad-based tax proposals, such as a state income or sales tax. It is difficult to imagine voters in heavily Republican House District 30 elected Knopp in the hope he would work tirelessly to diminish the Republicans’ power in the House by tanking their majority. District 30, after all, went with then-candidate Mike Dunleavy in the governor’s race 2-1 over Mark Begich, and was one of only a handful to pick Joe Miller over Lisa Murkowski in 2016. 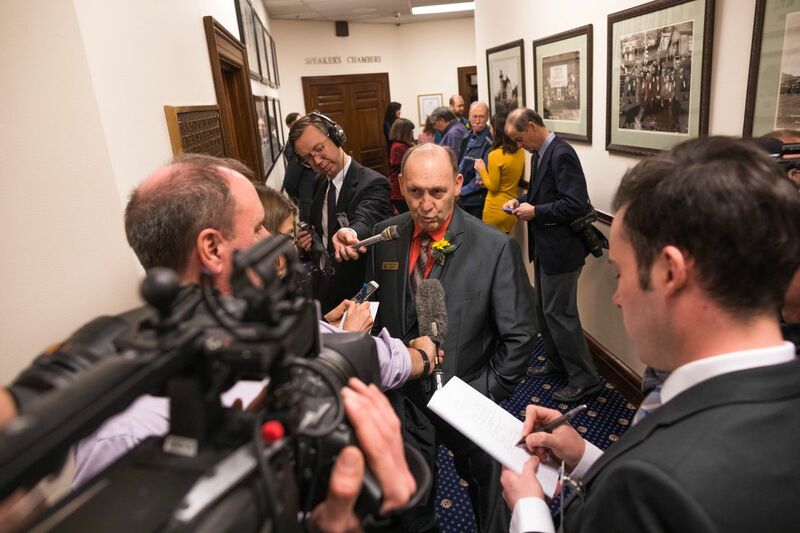 It is just as unlikely they wanted Knopp to hamstring Republicans’ ability to pursue Dunleavy’s agenda or that they sent him to Juneau to dictate terms to the Legislature and tie it in knots. The House’s late start means the Senate cannot do much; that the big issues facing Alaska - the Permanent Fund dividend, taxes, the economy, the budget, a fiscal plan - may not get the time or attention they require. Alaskans should be more than a little miffed. They should be outraged their House of Representatives cannot do its work. They should let their lawmakers know. Loudly and often. Then, somebody should hand Knopp a bill for $925,000. Paul Jenkins is editor of the AnchorageDailyPlanet.com, a division of Porcaro Communications.